Fancy outfit for this week! This is what I wore out to dinner on New Year’s Eve. My husband actually picked out this dress for me from H&M Maternity and I love it! It’s the perfect shape for my body – I need things that float away from my hips as I have quite a bit of junk in my trunk. I’ve had the pink flower sash thing for a few years (I think it’s from Arden B) and the shoes are from DSW. They’re not too high, which is great now that walking in heels is becoming difficult. This week has brought a few physical changes with it: my belly button is just beginning to flatten, which terrifies me, I can see a very light linea negra appearing, and I’ve noticed quite a bit of swelling in my hands and feet after walking a lot. I also cried over something really stupid the other day, so I’d say the hormones are having an effect on me as well. After three glorious weeks of winter break, I go back to work on Monday (sob). I’m not ready, but I never will be. 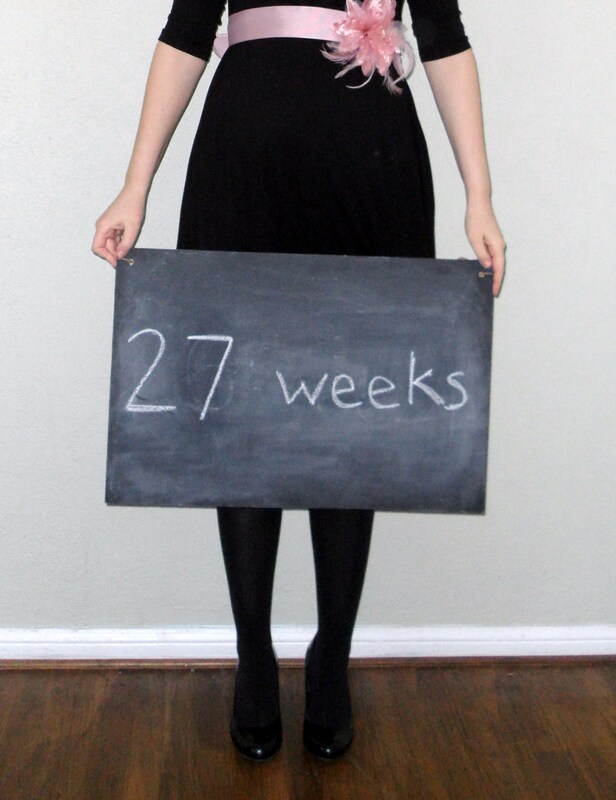 I know the time will fly by as I only have to work 12 weeks until my due date – and that’s if I actually make it that far. I hope to work as long as I can so I don’t have to use up more of my half pay illness time than I have to. I have a doctor’s appointment tomorrow and today I realized that he’ll give me the order for the glucose test and then I’ll have to miss a morning of work next week to go take the test. I called just before the office closed and they said I can go in early tomorrow morning and pick up the order and go across the street to take the test before my regular appointment time. I’m glad to get it out of the way, but I’m scared of the results. Wish me luck! Tonight I felt what I think were a couple of braxton hicks contractions, but I’m not positive. I’ll do a little internet research tonight and ask the doctor tomorrow. Oh! I got my first baby shower invitation in the mail today! Both of my showers are using the same invitation from Tiny Prints and I adore it. The first shower is in Fresno, where I was born. My aunts are throwing it and it will be mostly family that lives in Northern California. The second one is just one week later here in LA, thrown by my mom and friends. I’m so excited!! Love the dress/sash/whole ensemble! It’s coming soon!!! So cute! Love the invites…still can’t wait to hear what the name will be!